We offer Large Displays suitable for various industries and applications. Clear and long lasting LED Displays can connect to a host PLC's using protocols like Modbus, Devicenet, Profibus, Modbus TCP IP. The LED displays are Tri Coloured Dispalys and can be programmed. We provide various mimic panel for our clients which are offered to them at highly competitive prices.These mimic panels are electrical devices comprising of flat insulated surface that contains switches and meters for controlling other electrical devices. Power input 9 to 28 VDC power source. We offer Red Lion's CUB®4 series having a large display in a miniature package. No programming is required for these units making them ideal for basic applications. The CUB4 series features 3 1/2 to eight digit reflective LCD displays with red or green backlighting. 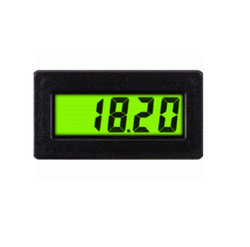 This easy-to-read display offers 12 mm character height and is NEMA 4X/IP65 rated. The CUB4 series provides a wide variety of inputs for industrial applications. CUB4 models cover both digital and analog signals including count, voltage, current and process inputs.